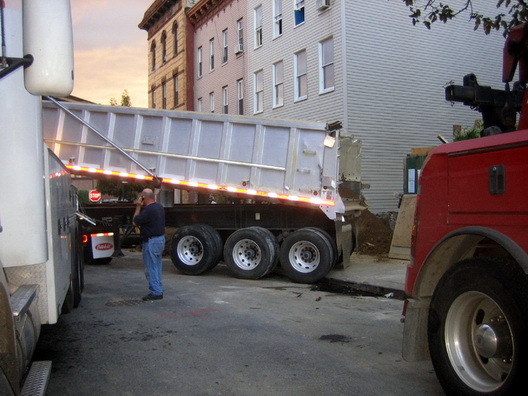 As the fine chaps at 53 Java Street were violating a stop work order today (pouring cement), the truck turned overturned and bruised up the front right-hand corner of its neighbor, 51 Java Street. As of 6:42 this evening they were still busy extracting it. Per the owner of 51 Java (who I spoke to this evening), this is the second time they have hit his property. This time he fears there might be structural damage. The first time (these people hit his property) was 3 weeks ago. That time it was an earth mover. They destroyed 1/3 of his garden. CALLER STATES THAT THE BOTTOM CORNER OF A BUILDING AT THE ABOVE LOCATION, WHERE THEY WERE CONSTRUCTION GOING ON THE CONSTRUCTION TRUCK OVER TURNED AND HIT THE BOTTOM OF BUILDING CAUSING STRUCTURAL DAMAGE. Can't wait to see how this one does, or doesn't, turn out. A pretty sunset shot of the house damaging truck, below. love the photo of the sunset! first off you need to get your story straight. There was a partial stop work order, which means you can still work on the site. 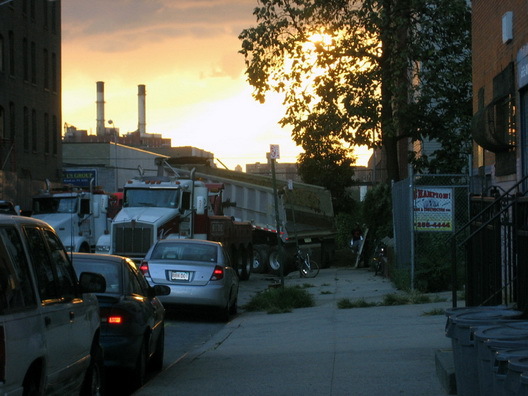 Secondly, it was soil being delivered not concrete. Mainly, no one was injured. no one was injured? how about no one's house? who's paying for no one's property damage? who's a big greedy slimemongering dickhead?